If there are any tickets left for Bard SummerScape's current production of Rocket to the Moon, grab them. Although Clifford Odets's drama was written and takes place in 1938, his exploration of the nature of love - how financial concerns affect it and how it changes when institutionalized by marriage - is timeless and universal. An inspired Broadway cast, excellent direction, and one of the finest set designs I've ever experienced combine to create a memorable theatre experience. Rocket to the Moon plays through July 24. 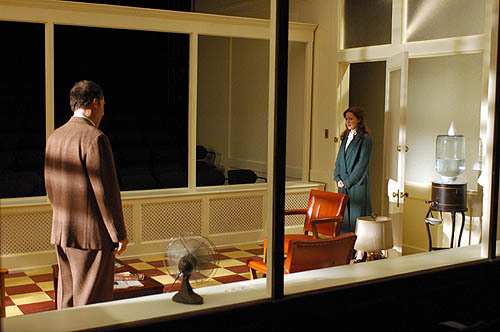 Although Odets is known for expressing progressive political and social beliefs in his plays, his beautifully drawn characters and their thwarted attempts to love each other take the fore in Rocket to the Moon. Never directly mentioned, the Great Depression looms ominously in the background. As the play progresses, we see for ourselves how economic hardships or inequities have a direct bearing on the characters' choices and behavior. Even before the play begins we are captured and enthralled by Andrew Lieberman's set design. Theatre Two, the smaller of the performance spaces in the Fisher Center, is a "black box" with moveable seating arrangements. As such, it has the advantage of tremendous versatility in staging performances. During Rocket to the Moon the audience sits on opposite sides of the stage. In between is the set: a complete dentist's office, replete with waiting room, an office, a treatment room, and a hallway to another dentist's office. Every detail is authentic to the period, from the furniture down to the water cooler. What makes this set extraordinary is the fact that we view it through large windows that appear to be made of glass, the effect heightened by the glass doors in the two smaller rooms. Looking at the play through these "windows," as if we're spying on the characters in their most intimate moments, is emotionally intense. At the same time, we can see the other half of the audience looking through their "windows" at the play and at us. We, the audience, and the characters in the play, are all mirroring each other. Thanks to Daniel Fish's masterful direction, every actor in the cast gave a highly professional and emotionally authentic performance. In the leading role of Ben Stark, David Chandler succeeded in cconveying the dramatic arc of his character's transformation. At first, we see Ben as a henpecked husband, emotionally suppressed, meek and mild-mannered. At his father-in-law's instigation, he falls in love with his bright young dental assistant, Cleo Singer (Kelly Hutchinson), and subsequently finds himself passionately involved and desperately out of control. As Ben's wife, Belle, Stephanie Roth Haberle endows her character with just the right combination of controlling bitchiness and vulnerability. David Margulies, who plays Belle's father, Mr. Prince, received spontaneous applause from the audience when he made his first exit during Act I. Some of the best lines in the play belong to the wealthy partriarch. His Jewish wisdom and ability to ride the fine line between seriousness and humor, make him an irresistible character, particularly when played by an actor of Margulies's caliber. Ben's office mates - Phil Cooper, DDS (Christopher McCann) and Frenchy, the podiatrist (Henry Stram) - are skillfully portrayed. Both men are clearly fond of Ben and do their best to advise and protect him. As Willy Wax, Danny Mastrogiorgio represents the world of show business and an entirely different set of values than those shared by the other characters. Kaye Voyce's authentic costume design immediately brought us back to the late 30s. Jane Cox's lighting design added the finishing touches to this technically perfect production that even brought the outside in with sunlight streaming through windows and a visible rainstorm. True Love Productions, formed in 2001 by Jeanne Donovan Fisher and Laurie Williams, produced this rarely seen play as part of their mission to present unique voices in theatre.